And we’re back! After an off week last week due to WUCC, Club Update is back in your feed. While very few ranked teams participated outside of Cincinnati, we recap the various club action around the country from the past two weekends! Also, if you missed our team’s great reporting from Cincinnati last week, you can check it all out here for the women’s, men’s, and mixed divisions. In a rematch of their pool play meeting, Virginia Rebellion edged past Gainesville Tabby Rosa on universe point, 11-10 at Club Terminus. On their way to a hometown win, Portland Frolic swept the competition at the one-day round-robin at Vactionland in Maine. Third-seeded Princeton Pine Baroness also won out in six round-robin pool play games at the Old Line Classic in Rising Sun, Maryland two weekends ago. In a showdown of two undefeated squads, #19 Atlanta Chain Lightning bested #25 Huntsville Freaks on double game point, 12-11 for the Club Terminus win. Sources tell me the Durham Brickhouse versus Atlanta Bullet was a true showdown; hopefully we’ll see a rematch at Regionals in a few months. Keeping with the theme of hometown wins up in Maine, Portland Red Tide rode a 7-0 record to a victory at Vacationland. Roll Tide. Even though they came in as the 11th seed, Minneapolis Mallard swept through The Royal Experience en route to a tournament win, going away. Indianapolis MomINtuM was undefeated in pool play but fell to Babe out of Centerville, OH at Layout for the Summer. On the weekend of July 14-15th, Cleveland Smokestack took down a slew of northeast squads at the Philadelphia Select Challenge. The best mixed teams from around California gathered in San Francisco and battled it out at Revolution. #15 San Francisco Mischief got revenge for a pool play loss beating #17 Los Angeles 7-Figures, 8-7. Headed into Club Terminus, Florida Weird was seeded third, but they emerged victorious after both pool winners fell in the semifinals. In an all New England field, Mansfield Darkwing demolished Fairfield Alt Stacks 13-4 to win Vacationland, after narrowly escaping Burlington Heartless in a double game point semi. On the way to a win at Bourbon Bash in Lexington, KY, Huntsville Outlaws accumulated an outstanding 8-0 record. No one could stop Dallas Tex Mix on their way to a championship at The Royal Experience who took the weekend with a 6-0 record. Even after falling to NC Galaxy in pool play, Raleigh Rowdy was able to claim the SunRise Open crown, dowing Galaxy in the finals. In a special section this week, here’s a rundown of who took home the hardware at Masters Nationals this past weekend. The Minneapolis Surly COUGARS blew through the competition to claim the Women’s Masters crown — they only gave up 13 goals on the weekend en route to a convincing national title. The only Mixed Masters team in attendance in Aurora that is also heading to WMUCC next week won a championship as a lead up to the worlds event; Minneapolis Hey Babe improved on their fourth place finish last year by earning the second ever Mixed Masters national title. Minneapolis completed a clean sweep of the youngest Masters divisions as Surly raced by all challengers in the Men’s Masters division, besting Madison Royal Stag in the final, 15-4. 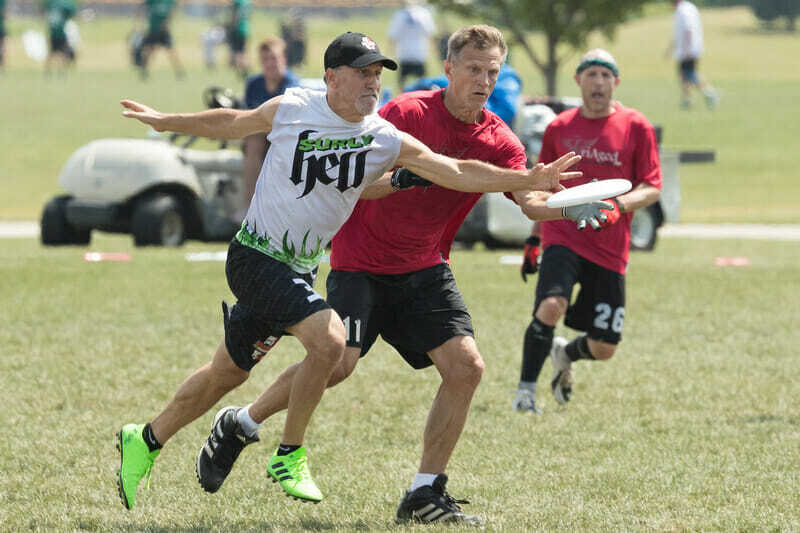 Surly’s Men’s Grandmasters squad couldn’t keep the magic going as they fell 15-13 to Santa Barbara Eldors in the weekend’s tightest final game. California also won the Women’s Grandmasters division, as San Diego Furari bested women from Boston 15-11 for a title. The Twin Cities also picked up a win in Men’s Great Grandmasters, via yet another Surly squad who knocked off the defending champs, San Francisco Relics. In the only other sanctioned action this weekend, the Truckee River Ultimate Cooldown will host five mixed squads from Northern California and Nevada. Comments on "Club Update: It’s All USAU From Here on Out"